Doyle is a great author from Ireland. I’ve read several of his books. This book was waiting on my shelf for a while, but I had to buy and read the first book (A star called Henry) from ‘The last roundup’-trilogy before reading about the continued story of Henry Smart. When travelling in Ireland this summer, I just had to read another book by Doyle. I bought two more while I was there, so in the next years there’ll be plenty of reading material from Doyle left for me. In part two of the trilogy our hero Henry Smart has travelled to the United States, like many Irish did in the twenties. Doyle has done plenty of research, given the two full pages (and when I say full, they really are full) of bibliography at the end of the book. Smart adapts easily works hard and soon makes a decent living in New York. But as always he ends up in trouble and escapes from Manhattan. Travelling the country he ends up in Chicago as the white man Louis Armstrong (yes, the musician) needs for his career. Bodyguard, manager, personal assistant, whatever you call it, he is there. And all kind of strange adventures happen to the weird couple. Obviously the mob, the mafia, plays an important role, as was the case in Chicago in those days. Out of the blue Henry bumps into his wife and kid again, the story seems full of coincidences. Compared to the first book Smart turns a little towards one-dimensional. The growing up in Dublin, becoming involved with the IRA made him more credible. This book, however well written and well researched, still seems a bit far fetched. Perhaps that is the reason that the third part of the trilogy hasn’t been published (been written?)? 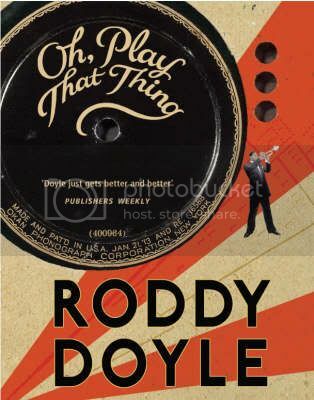 It’s been four years ago since ‘Oh, play that thing’ was available, Doyle has several other books to his name since, but ‘The last roundup’ still isn’t the trilogy as promised. Good book, but certainly not near his best, imho.